There’s no stopping John Carver’s Deeping Rangers Under 15 side. 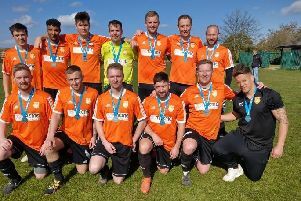 The unbeaten Peterborough Youth League Division One title fancies remain on course for a trophy treble for the second season running after disposing of Glinton & Northborough Amber 4-0 on Sunday in the PFA Cup. Nathan Lane (2), Alexander Moroz and Liam Scales were the lads on target for a side who are also through to the semi-finals of the League Cup. Peterborough Northern Star Blue, another unbeaten side in Under 15 Division One, were convincing PFA Cup winners as well. They knocked out Stanground Sports 7-0 with James Pam collecting a hat-trick. In Under 15 league action there was a shock in Division Three as leaders Thorpe Wood Rangers Red fell to a 5-3 defeat at home against Glinton & Northborough Black. Jack Mason (2), Matthew Sedgwick, Alexander Cookson and Ryan Christian grabbed the glory for Glinton with Jacob Hoffmann (2) and Lewis Harwood scoring for Thorpe Wood.